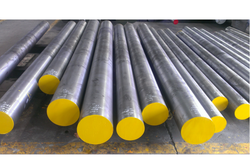 We are the leading manufacturer of a wide assortment of Alloy Steel to our precious clients. Our product range also comprises Bright Bars and Steel Plate. These products are precisely fabricated by our skilled professionals using modern techniques and the finest quality raw material. We also offer our products in various shapes and sizes in order to meet various requirements of clients. Numerous clients like our products, which makes us a prominent manufacturer of Alloy Steel Bar in the market. Our offered range is technically manufactured using the best quality raw material available in the market and the most advanced technology under the skilled supervision of professionals. Before delivering our product to clients, it is rigorously tested on well-defined parameters of quality. We are offering a premium assortment of finest grade industrial items. Our range of Alloy Steel Rod is known for its huge robustness and superior durability. These rods are uniformly tested for their elasticity and stiffness. To meet the demands of clients we offer customization facility as well.